as treasurer of the Kenowa Hills Public Schools Board of Education. The youngest elected official in west Michigan, Szczepaniak obtained the position in 2017 as a high school graduate and college freshman. 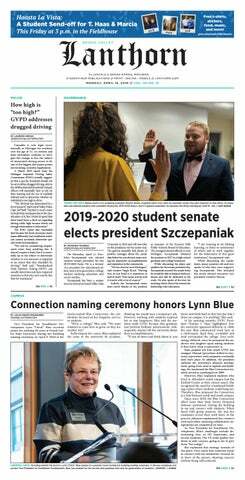 While discussing his plans and qualities for the senate president slot, Szczepaniak assured the senate body he would be able to balance both positions and still be dedicated to his work. He also spoke of his love for teaching which drives his interest for leadership roles education. EXECUTIVE ORDER SPARKS FREE SPEECH DISPLAYS After President Donald Trump’s recent executive order for universities to uphold all forms of free speech on campus or risk losing federal funding, a group of anti-abortion activists from Grand Rapid’s Inner City Church Planting Mission showed up on Grand Valley State University’s campus April 8 to see how officials would respond. Demonstrators initially set up near the Cook Carillon Tower (a designated free speech zone of GVSU), then later left the zone to see if campus police would respond. Police did not interfere. GVSU’s Pro-Life organization also had a display up near the Carillon Tower from April 8 to 11. Their display included “The Cemetery of Innocents,” which was marked by rows upon rows of pink flags, with each representing 927 aborted babies. The organization was unaware that the other group would be demonstrating and is unaffiliated with them. To view the full story, visit lanthorn.com. STUDENT SENATE RESOLUTION PRESSES BOARD OF TRUSTEES FOR STUDENT PARTICIPATION Student senate introduced a proposal to the Board of Trustees that seeks to improve and foster student participation within the board’s decision making. If accepted by the board, the proposal will seek more opportunities for student input and ideas on board decisions regarding students. The proposal includes several requests including subscribing to open meetings, adding public comment opportunities and holding meetings in closed sessions only when empowered by the Open Meetings Act of 1976. Student senate president Rachel Jenkin, who coauthored the proposal along with incoming president Eric-John Szczepaniak, explained that she sees the proposal to promote the inclusion of more student voices on changes being made at GVSU. “We want student representation on our board, both in a literal sense for real-time commenting on the issues that they are discussing, as well as in a symbolic sense so we can have it documented that students are present at every meeting,” Jenkin said. “There are people making decisions the impact us as students, however, this is no one in that space to represent us through the tough discussions and voting.” To view the full story, visit lanthorn.com. Following the public announcement, Grand Valley State University was able to flaunt six of its students and alumni as semifinalists for the 2019-20 Fulbright U.S. Student Program. The program provides students with the opportunity to teach English or conduct research oversees. Bethany Mazurek, Anna Szalay, Kellie Corbett, Emily Heyburn, Melina Frantzeskakis and Dallas Davis were all named as semifinalists in the competition and will either complete a Fulbright English Teaching Assistantship or conduct independent research. At the Lanthorn, we strive to bring you the most accurate news possible. If we make a mistake, we want to make it right. 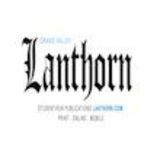 If you find any errors in fact in the Lanthorn, let us know by calling 616-331-2464 or by emailing editorial@lanthorn.com. The Grand Valley Lanthorn is published weekly by Grand Valley State University students 31 times a year. One copy of this newspaper is available free of charge to any member of the Grand Valley Community. For additional copies, at $1 each, please contact our business offices. On the night of Wednesday, April 10, the brothers of Alpha Epsilon Phi (AEPi) and various students gathered in Lake Michigan Hall to commemorate the lives lost in the Holocaust. The silent walk from Lake Michigan Hall to the clock tower was meant to honor the 110 mile death march hiked by Jews, blacks, gays, gypsies, disabled persons, prisoners of war and more. AEPi’s march was walked in honor of Holocaust Remembrance Day on May 2. Their motto focuses on developing leadership for the Jewish community and strives to give members a home away from home through their union in Jewish values and commitment of brotherhood. through vaccinations. Usually, these vaccines are given to children within their first two years of life. According to WebMD, “The MMR vaccine is 97 percent effective after two doses. Doctors recommend that children get the first dose when they’re between 12 and 15 months old, and the second between four and six years old.” Those who contract measles often experience high fever, red eyes, a runny nose, a sore throat and a large rash. People who have vaccinations are not only better protected from measles, but they also eliminate the risk of infecting others. The recent outbreak of measles is believed to be due to the raising number of anti-vaxxers, who prefer the possibility of getting measles over the possibility of having a child with long-term health issues. Those who don’t have the vaccination are at a high risk of contracting the virus and then spreading it to others. Vaccinations were created for a reason: to protect people from harmful and even deadly diseases. With the measles vaccine, we have a chance to eliminate measles for good. Anti-vaxxers may be trying to avoid implications, but their actions unintentionally create other issues. Anti-vaxxers cause more harm than good. The measles vaccine, MMR, is available at the GVSU Health Center in the Allendale campus. Those who are interested in obtaining the vaccine can set up an appointment by calling (616) 252-6030. GVL OPINION POLICY The goal of the Grand Valley Lanthorn’s opinion page is to act as a forum for public discussion, comment and criticism in the Grand Valley State University community. Student and columnist opinions published here do not necessarily reflect those of the paper as an entity. The Lanthorn strives to be a safe vehicle for community discussion. With this in mind, the Lanthorn will not publish or entertain any forms of hate speech, but neither will it discriminate against any other views, opinions or beliefs. The content, information and views expressed are not approved by—nor do they necessarily represent those of—the university or its Board of Trustees, officers, faculty or staff. are a lot of great resources online - but if you want to cram for Endgame the fun way and watch some movies instead of researching, I do have some suggestions. Avengers: Endgame is the fourth Avengers movie, so the obvious thing to do would be to watch Avengers, Avengers: Age of Ultron and Avengers: Infinity War. However, even if you watch all three of those two-hour movies, you still might not be prepared for Endgame, because the events of Guardians of the Galaxy are pretty important as well. So is Captain Marvel and AntMan and the Wasp. You can probably skip Age of Ultron, but the rest of those movies contain the answers to those previously asked questions. Watch them and you can go into Endgame ready to enjoy the highly anticipated flick without any anxiety about being confused. more liberal than west Michigan would like a little less conflict with their organizing. Complaints about being shut down on college campuses from conservative activists like Kristan Hawkins, the president of Students for Life of America, were a big part of Trump’s inspiration for his executive order to protect free speech on college campuses. It directs the federal agencies that fund university research to makes schools “vow” to uphold the First Amendment. “We’re delivering a clear message to the professors and power structures trying to suppress dissent and keep young Americans . . . from changing rigid, far-left ideology,” Trump said, explaining the order. “If the university doesn’t allow you to speak, we will not give them money — it’s very simple.” It is very simple. In fact, ACLU Senior Legislative Counsel Kate Ruane concluded that “it tells public universities to abide by the First Amendment, as they are already required to do, and private universities to abide by their existing policies,” which they already follow. Have you ever been to GVSU’s speech lab? Is it okay to drive under the influence of cannabis? YEAR: Senior MAJOR: Public & Nonprofit Admin HOMETOWN: Muskegon, Mich.
YEAR: Senior MAJOR: Allied Health Science HOMETOWN: Portage, Mich.
YEAR: Senior MAJOR: Advertising & Public Relations HOMETOWN: Muskegon, Mich.
YEAR: Senior MAJOR: International Marketing HOMETOWN: Naperville, Ill.
health care provider, urgent care center or emergency room before seeking care. This will allow the practice to take steps to avoid exposing others.” GVSU health staff are committed to making sure every GVSU student has the resources for staying healthy and active. Health staff are committed to keeping it that way through helping educate students, encouraging vaccinations and keeping an eye on any health threats that could become dangerous to the university and its students. sidering attending the University of Michigan for his master’s degree in public affairs. The hands-on atmosphere and work with clients are two reasons that the program would suit his goal to become involved in real-life issues. The process of working toward creating a better and improved government system is something that Jones takes pride in and hopes to continue to strive toward that goal for the 2020 election as well as and ones in the future. Finals is a stressful time for students and professors alike. To provide some much-needed relaxation, the Grand Valley State University Campus Activities Board is hosting Goat Yoga at the Kirkhof Center 2263. The event is taking place at 7 p.m. on Thursday, April 18 and is free and open to all GVSU students, faculty and staff. Yoga is known to be a relaxing, peaceful form of exercise that boosts brain power and mindfulness. Mixed with baby goats, this event will provide students with exercise, relaxation and fun. The class will be run by one of GVSU’s yoga instructors. All levels of experience are welcome to attend. For more information, contact Campus Activities Board at cab@gvsu.edu. tain her prior commitments is beyond admirable, coming to the realization that her “normal” would have to be redefined was a big step for Pearl. “After talking to my mom, we recognized that I had to redefine normal in my life,” Pearl said. “I’m used to operating at a super high level with work, school, sorority and all the other responsibilities that I’ve been trying to balance. Sometimes I need to pick between one or two, but right now I’ve kept all three. Some days it’s not the best choice, and I need to take a day for myself. It just depends on the day. It’s one day at a time.” All of this is achievable through Pearl’s relentlessly positive and persistent attitude. Through her “tell me why not” approach to every situation, she has refused to allow others to limit her potential. “There have been many steps in really being an advocate for myself in the sense of, ‘Tell me why not,’” Pearl said. “Don’t just tell me not to do it. that donated the most won a $100 award for their philanthropy or chosen charity. This year, the winner was GVSU’s Gamma Phi Beta, whose members donated 225 items. By the end of their six hour stake, Sigma Pi members successfully collected more items than last year. “At the end of the week with Stuff the Bus, we raised 1,424 donations of non-perishable items to add to GVSU Food Pantry,” Wilson said. “Sigma Pi, together with other organizations, helped those who struggle financially to provide themselves with food through Stuff the Bus.” ACE week was largely successful this year, and through their acts of kindness, the Sigma Pi members showed their true Laker Effect. The Grand Valley State men’s tennis team traveled to Caledonia, Mich. and defeated GLIAC rival Davenport, 4-3. With the win, the Lakers improve to 15-6 overall and 5-2 in GLIAC play. While the Lakers weren’t able to come away with wins in No. 1 and No. 2 doubles, GVSU did pick up a 6-0 win in the No. 3 spot, with Jack Dausman and Nicholas Urban taking the victory. GVSU made up some ground in singles, with Sebastian Lescoulie winning from the No. 1 spot. Dausman, Urban and Eric Zwemer also picked up wins from the No. 3, No. 5 and No. 6 spots, respectively. The Lakers will be back in action on Sunday, April 14, for their final regular season match against Purdue Northwest at the Premier Tennis Athletic & Tennis Club in Grandville, Mich. GVSU will also be honoring their seniors at the event. The No. 22 Grand Valley State Lakers led the entire game in their 21-3 win over Northern Michigan on Friday, April 12, in the second annual Multiple Sclerosis Awareness Game at the GVSU Lacrosse Stadium. Twelve different Lakers scored in the win, as Carly Shisler led the scoring with five goals. Sarah Staagard contributed a hat-trick, while Annie Yost, Skyler Simmers and Abbi O’Neal all scored twice. With the win, the Lakers improve to 10-3 overall and 7-1 in GLIAC play, winning their last four conference games. They look to improve upon both those records on Thursday, April 18, as they host Lewis at 7 p.m.
change their schemes on defense based on the personnel provided. That was especially clear at the spring practice, as after running a 4-3 front for the majority of the 2018 season, the GVSU defense played more of a hybrid style, experimenting with a 3-4 front while playing a lot of nickel coverage. “We really overhauled our defense, doing some different things with our front and linebacker play,” Mitchell said. “We felt like we had to be better than we were last year, and we have enough humility to understand we can tweak some things on defense to be better, so that’s what we did.” The defensive side isn’t the only side of the ball that’s seeing changes, as although many key skill players like running back Chawntez Moss and wide receiver Austin Paritee will return, the person throwing them the ball will, for the first time in four years, not be Bart Williams. GVSU’s all-time leading passer left some big shoes to fill under center, but after developing behind him over the past few years, junior quarterback Cole Kotopka has had a strong spring and is ready for his time to start. “This is my fourth spring, so I’m pretty used to what’s going on,” Kotopka said. “We learned a lot of new things this spring. We put in some cool stuff, and I’m very happy with how it turned out.” While Kotopka has the most experience of any of the GVSU quarterbacks, he’ll still have to compete with fellow gunslingers Nathan Barko, Austin Brown and Cal Endicott for the starting spot, and Mitchell is excited to see the guys push each other with a starting role on the line. “We’ve been really excited about these quarterbacks. Cole’s in the lead, but we’ve got talent at that position and it will be a different offense than what we had with Bart,” Mitchell said. “It’s kind of invigorating to have (the competition). We’ll miss Bart’s experience, but having a different guy in there, we’re looking forward to that process too.” GVSU will kickoff the 2019 season Saturday, September 7 at 7 p.m. against the Edinboro Fighting Scots. GVSU’s 2019 schedule will feature seven home games, including four of their first six games taking place at Lubbers Stadium. country in the industry and collect reputable contacts for their careers ahead. He’ll continue to stay in touch with the coaches and higher-ups. “They’re not going to be connections or people who are going to help you out unless you keep talking to them, getting to know them and putting in that work on the side which was part of my process.” Spryszak said. “The week after, I texted all them, had a little conversation with all them and that’s just the start.” The soon-to-be Laker alumnus will now focus on locking in a graduate assistant program with a Division I program, solidifying his place in the college basketball universe. I wanted to go to,” Lipovsky said. “But as soon as I drove under the big GVSU arch, I turned to my parents and said ‘this is where I need to go.’” Lipovsky has seen herself improve greatly as a pitcher in four years at GVSU and she credits assistant coach Jen Rivera and maturity for her steady improvement throughout her time in Allendale. “I’ve grown a lot in my time here, I’ve focused on my mental game since I came in at (age) 18, learning time management and being able to go out and play,” Lipovsky said. “When I started out, I only had a rise ball, and then coach Jen Rivera waved her magic wand. I try to soak up from her, I’ve added a few new pitches and I can throw in every direction.” When Lipovsky takes the mound for GVSU, it’s almost like she can ‘scan’ the batter, analyzing what will work while keeping a cool head. “When I’m on the mound, I think about the batter ahead of me and analyze what I did in previous pitches,” Lipovsky said. “Turning around is my reset, if I get an 0-2 count, I won’t give a good pitch, and if it’s a fresh count I’m attacking the batter.” That versatility and mindset on the mound has made Lipovsky a force to be reckoned with, and in her senior season, Lipovsky has tried to be more of a leader on the mound to help her teammates play to the best of their abilities. allowed seven hits and continued to lead the conference with 16 wins under her belt. GVSU continued on in the second game, leading 1-0 in the first inning before Taylor Rierger hit a two-run home run in the second her fourth of the season. “I actually do not look at my stats throughout the season,” Reiger said “I just try to do my best for the team every game, do my role, complete my role and help my team.” The Panthers answered with their first run of the second game before GVSU retaliated with two more, making the score 5-1 until the beginning of the seventh. Davenport refused to quit, as they scored four runs in the seventh tying the score up 5-5. However, the suspense didn’t last long, as the Lakers were able to get a hit and send Brooke Henning to score and break the tie, ending the game at 6-4.
ers fought for a comeback in the fifth inning when Taylor Rieger hit a two-run homer and Bailey Thatcher hit another in the sixth, but the Lakers lost 6-5. The Panthers scoring continued through the second game, including three runs in the fifth and sixth. The Lakers were able to gain two more runs in the sixth and another in the seventh, but that was not enough to overtake the Panther’s lead. That game finished with a score of 7-6. Even with the three losses on the week, Callihan is still enthusiastic and hopeful. “We are happy where our team stands right now,” Callihan said. “We play in a tough conference and everyone is out to get us, we just need to focus on playing our game pitch after pitch.” That Lakers continue play on Tuesday, April 16, in a doubleheader against the Wayne State Warriors. From Friday, April 12 to Saturday, April 13, it looked as if the troubles that have been plaguing this Grand Valley State baseball team are in the past, as the Lakers swept Wisconsin-Parkside across two doubleheaders over the weekend. According to GVSU head coach Jamie Detillion, this success is what his team is capable of looking like when they play at their best. “It was good to see the guys put it all together this weekend,” Detillion said. mance,” Kimes said. “I don’t need to get recognition to feel like I jumped well.” The Lakers’ distance runners competed at the Bison Outdoor Classic, hosted by Bucknell University in Lewisburg, Penn. Hanna Groeber was the first to place for the Lakers after a secondplace finish in the women’s steeplechase, where she set a new personal record and the second fastest time in the country, crossing the line in 10:23.52 seconds. Grand alle a e ni er i Far er ar e taking place this summer from June - October. Every Wednesday at 10am t o 1:30pm. Go to gvsu.edu/farmersmarket for more information. We are looking for 3 people to take our lease in Trio Center for the summer months. Preferably June 1st to end of August. But, if you need the month of May we can move out early. Four bedrooms, two and a half bathrooms, air conditioning, washer/dryer, dish washer, and deck on the back! Rent is $420 a month and utilities are never more than $30 per person. Contact (269) 3622335 for more information. If the local coffee shop has awarded you “Employee of the Month” and you donʼt even work there, you may be drinking too much coffee. Grand Final Glow 5K 2019. Taking place on Saturday, April 13th starting at 8:00pm. Following the 5K, join us for a Silent Disco at 9:30pm near the Clock Tower. Which type of vegetable tries to be cool, but is only partly successful at it? I spent four years in college. I didnʼt learn ?a thing. It was really my own fault. I had a double major ?in psychology and reverse psychology. 23rd Annual Student Scholars Day taking place on April 10th, 2019. Presentations and events begin at 9:00am and end at 5:00pm in Henry Hall Atrium, Kirkhof Center, and Mary Idema Pew Library. Lakers are confident in their ability to perform. “We are the most complete team in Division II,” Johnson said. “ I just think everyone has to step up to the occasion,do their job, and we will be fine.” The men’s and women’s teams will both be back in action Thursday, April 18 at the MT. SAC Relays in Walnut, Calif., before returning home Saturday, April 20, for the first home meet of the outdoor season, the Al Owens Classic. What did the hot dog say when his friend passed him in the race? Wow, I relish the fact that youʼve mustard the strength to ketchup to me. Grand Finale Glow 5K 2019. Saturday April 13th at 8:00pm. Register by April 5th to receive a race t-shirt. R e g i s t e r a t gvsu.edu/rec/grandfinale5k. Monday on newsstands and 24/7 at lanthorn.com!